la gentilezza dei titolari, la location con vista superlativa la fanno da padroni. Certamente torneremo. Where to find Castellabate hotels near an airport? Where can I find hotels in Castellabate that are near tourist attractions? Should you be seeking comfortable lodgings in Castellabate, you'll find options aplenty! Spend some time checking out Expedia's 32 hotel options, which are all within a 0.1-kilometre (0.06-mile) radius of downtown Castellabate. A key to trouble-free vacationing is finding a convenient location to base yourself, so check out the latest offers at the Palazzo Belmonte and Villa Sirio, all of which are within a 1-kilometre (0.6-mile) radius of Castellabate's city center. The La Pergola is a budget-conscious hotel. It's nicely situated 0.9 kilometres (0.5 miles) from downtown Castellabate. Alternatively, you may like to look into the Residence Tamara Apartments. The Le Palme can be found 18 kilometres (11 miles) from downtown Castellabate. Another hotel is the Oleandri Resort, which is situated 18 kilometres (11 miles) away. The Hotel Leucosya as well as the Savoy Beach Hotel are some other accommodation options worth checking out in Castellabate. Looking for things to do? Consider spending a few hours exploring Lido del Villaggio e Campeggio Nettuno and Lido Mec, in Paestum, 16 kilometres (10 miles) to the north of Castellabate. 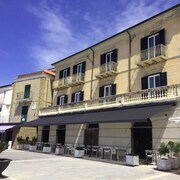 The Meridiana Hotel Paestum and Minerva Resort Hotel Paestum are a few of the hotel options in Paestum. 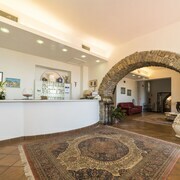 Or, you could stay in Marina di Casal Velino, 19 kilometres (12 miles) to the southeast of Castellabate, where you can pick from the Agriturismo Zio Cristoforo and Hotel Venere. Should you choose to stay in Marina di Casal Velino, be sure to check out the Casal Velino Marina and Casal Velino Watchtower. Get your fix of local sport with a visit to Stadio San Paolo, which is 90 kilometres (55 miles) to the northwest of Castellabate. Sports fans wanting to find a room or apartment close to the action can make a choice from the Grand Hotel Parkers or the Hotel Micalo. Situated 85 kilometres (54 miles) from Castellabate is Naples International Airport. Stay nearby at Romeo Hotel or La Ciliegina Lifestyle Hotel. 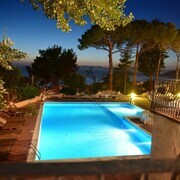 What are the most popular Castellabate hotels? Are there hotels in other cities near Castellabate? What other types of accommodations are available in Castellabate? Explore Castellabate with Expedia.ca’s Travel Guides to find the best flights, cars, holiday packages and more!